For professional and polished sign displays, Sign Bracket Store offers Indoor Sign Frames, Outdoor Sign Frames, and Indoor Sign Displays. Our user-friendly sign holders are ideal for business signs displayed on sidewalks, in shopping centers and banquet halls. We use 1" steel tube to construct these fixed frame sidewalk signs. The cover bolts on these sign frames, secure the sign perfectly with metal sign brackets, thereby ensuring its stability. The base on our freestanding signs are removable, and the sign frame bottoms are angled to stake into the ground to create an Outdoor Sign Frame ideal for certain environments. With our durable powder coated free-standing and hanging sign brackets, they are designed for long-term protection from the elements. Another display that can be used as an outdoor sign frame is our Decorative Sign Holder with a twist. This is a lovely pedestal sign frame that holds conventional sign sizes, easily dropped in from the top for convenient use. 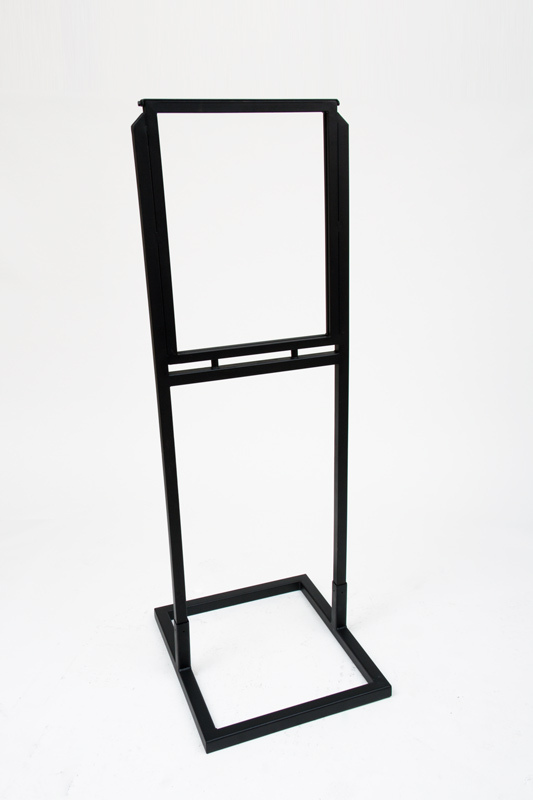 It's unique twisted shaft on the indoor/outdoor frame is adaptable for sidewalk signs in a conventional three feet height, with a one foot square base for stability. In addition, we also carry a rectangular adjustable straight arm hanging sign bracket with a 30" arm with a variable height arm. If you have been looking for heavy duty yet decorative sign frames, you have come to the right place. The Sign Bracket Store has a solid inventory of business signs, including sidewalk signs and hanging sign brackets, from which to choose. With so many options, it's easy to create sophisticated and professional signage for your business. From attractive indoor freestanding aisle signs to durable outdoor metal sign brackets that withstand harsh weather elements, you can quickly draw attention to your business or any special promotion you have going. From fixed mount to free-standing swinging signs, you can be confident your sign will stand the test of time. The durable metal is further powder coated to protect all surfaces of your sign brackets. In addition, joints are securely soldered and coated as well, allowing your industrial strength sign to resist rust, breakdown or wear as often occurs with lesser metals or untreated brackets. In addition, each of our sidewalk sign plate bases are weighted to prevent tip-over, ensuring maximum stability. This lets your customers and clients know you've selected quality signage just as effective as everything else your sell. In our free-standing aisle sign category, we carry several styles built to last. Our Contemporary Steel Sign Holder with steel tube framing sporting a contemporary flare, with angled bottoms for direct burial placement. With our Decorative Sign Holder with a Twist, it is perfect for double sided signs with its fun and frisky twist-style pole, adding elegance for passersby reading about your business. And in addition to our sidewalk signs, our hanging sign brackets come in multiple designs and styles. Examples include out Mezzo Mount Trapeze Banner designed for posts, the Adjustable Height Straight Arm, our side mount Bel Largo sign holder in either a single, double, or triple version, lighted or plain, Modular Sign and Banner Brackets, the Triangle Truss hanging sign bracket, the You-Are-Here sign bracket and holder, our lighted post mount Double Oval Sign Frame with Scroll. You'll want to check out all our sign options. Call our customer service staff today.